A theatre trip has become one of our Christmas holiday traditions, this year was no different. 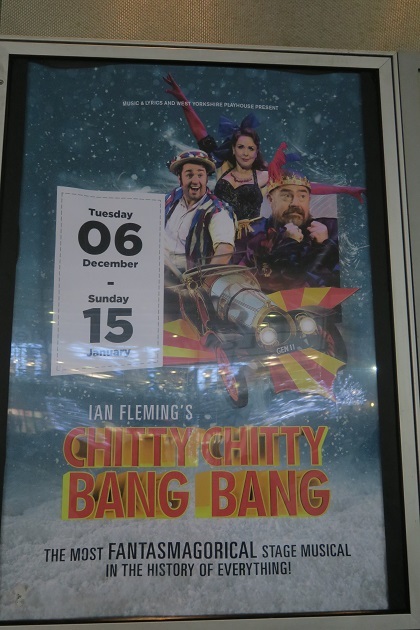 Chitty Chitty Bang Bang at the Lowry Theatre in Salford was all singing, all dancing and a great festive treat. We brought Son to see Chitty several years ago, he has no recollection of that so this visit was highly anticipated and we got into the mood by watching the movie (several times for him). On the way to the theatre we caught the end of a lovely little market. 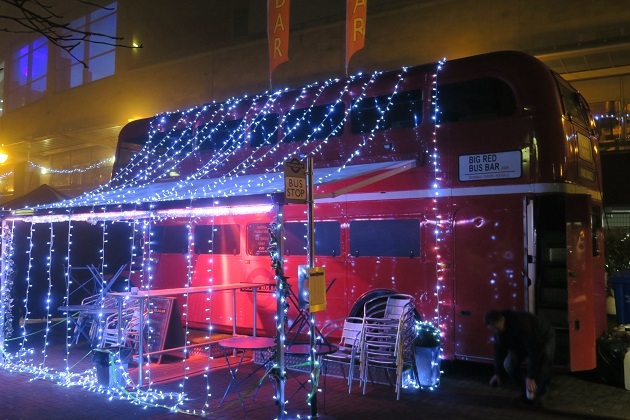 Unfortunately the stall holders were mainly packing away, we regretted not coming earlier if only to have a drink in this great red double decker. 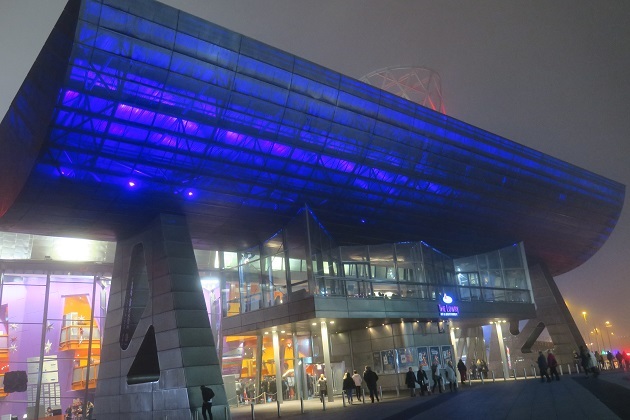 The Lowry is one of our favourite theatres, modern with super comfy seats which have oodles of legroom, we’ve never had a bad view or seat, this time was the same. We loved the show. Caractacus Potts was as eccentric as ever, the Childcatcher was creepy and very original, the music and choreography were wonderful and the stage design was very clever. All round great fun with the star of the show being that car – the “flying” at the end of the first half was so impressive. Chitty tunes still playing in our heads, we took a stroll afterwards through the MediaCity area to check out Light Waves. There were nine “artworks” illuminating this whole area, just the thing to brighten up a dark winter night. 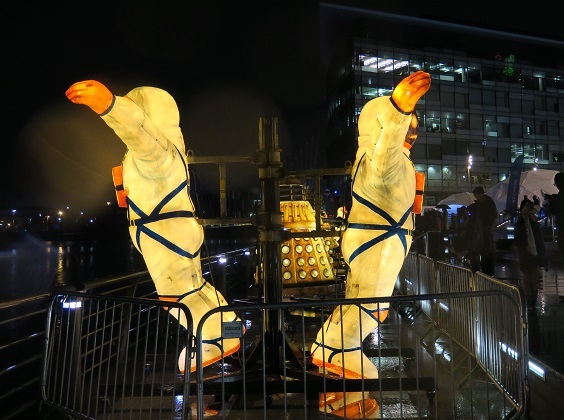 Son’s favourites were the Daleks and Spacemen by the waterside – a little bit of Blackpool as these were some of their famous Illuminations borrowed for a short while. 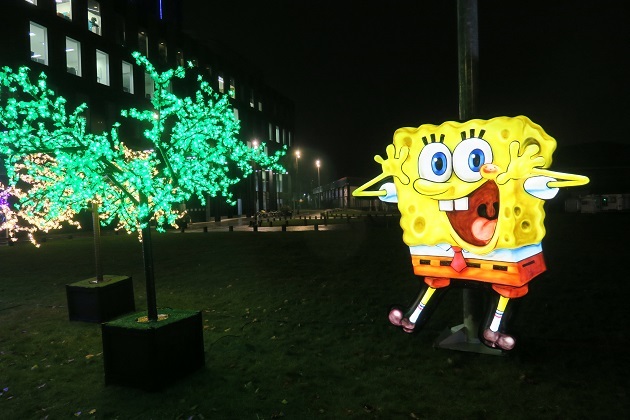 Spongebob and Noddy looked impressive too and those LED trees were spectacular. 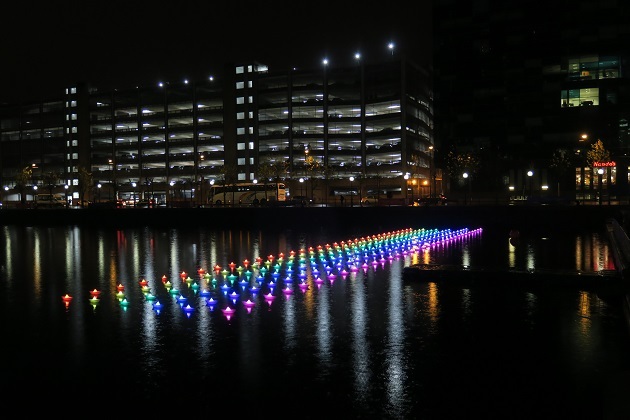 We found this piece which apparently was part of Amsterdam’s Lightworks last year. 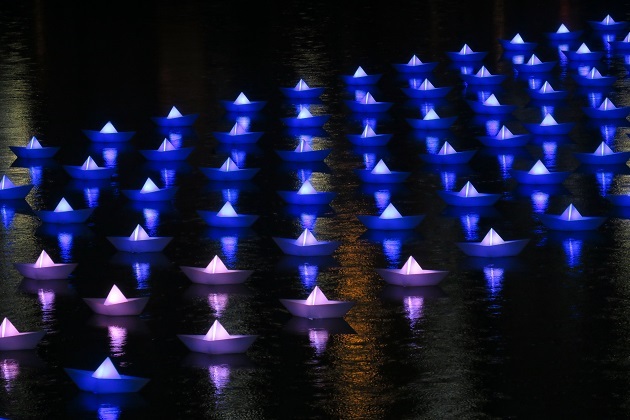 One last light filled treat was these little origami boats – 198 in total – floating on the water and changing colour as we passed. this is amazing post…you always have a touch with new adventure – you should have your own book.. Thank you!! Your piano site looks good. 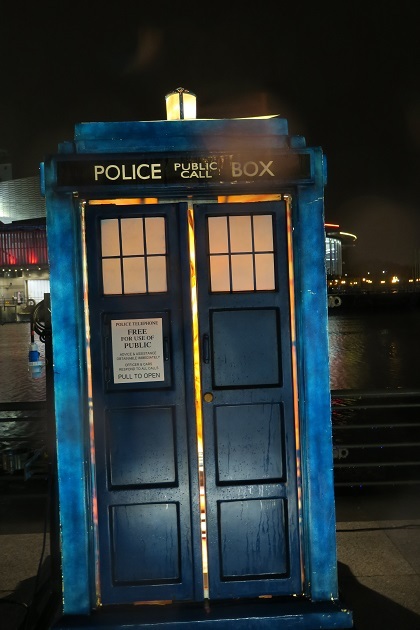 So pleased you enjoyed your visit to the Lowry. We like to go here as well. The floating origami boats look sensational and add lots of colour to this dreary January morning. 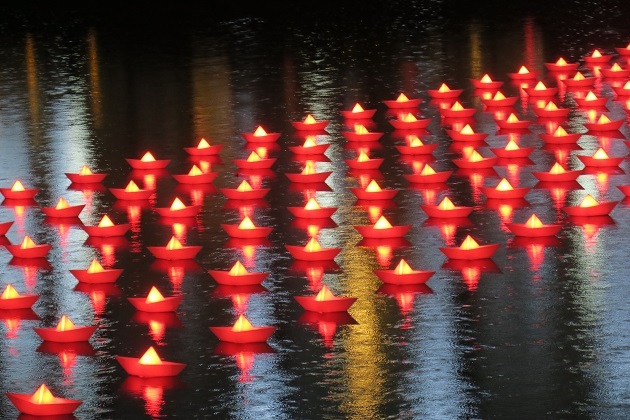 I loved those little boats – such a simple idea but so lovely. Hard to believe all the sparkle of Christmas is over now – back to school this morning for our son was not easy!!! It’s always hard going back to work and school after Christmas and with the weather so dreary, it seems an eternity to February half term. I’m sure he’ll enjoy it once he’s back in the routine. Do you take him by car or does he travel by bus? Our boys were fortunate to have a sought after grammar school only 30 minutes walk away from home so they usually walked. That’s perfect when you have a great school in walking distance. We take our son by car, his school is in Manchester so walking isn’t possible and although he could get a bus it would take a long time – that would mean getting up earlier which would be a problem given this morning’s performance!! Wow, you watched Chitty Chitty Bang Bang! So cool! And what a lovely Christmas atmosphere all around! It was such a fun show – the lights were the icing on the cake for a great evening! A perfect evening! I can imagine the magic about it all! Happy 2017 to you too Tanja – may it be full of good things and great travelling!! Lovely lights. Back to school, ouch! They’re off till Thursday here – today is still a holiday in lieu of Jan 2nd which was in lieu of Jan 1st so I think we’re all a bit confused. Another holiday though Anabel – I’d be happy with that!! He finished school quite early before Christmas so did have plenty of time off – didn’t make getting up this morning after a lazy holiday any easier though! Sounds like a lovely time. Those origami boats are so completely charming. I loved them too Laura – could have watched them changing colour for hours, strangely mesmerizing. Aaaah those boats are amazing and so magical! We always do a theater trip each holiday season too :). I love going to the theatre anytime but at Christmas it’s even better. This was a great show – loads of fun! Oh what a fun evening out. Have a great New Year. We all had a great time Terry. Happy New Year to you as well – health and happiness. Joy, the origami boats are amazing! Your evening was fun and I love that your son is exposed to so many wonderful experiences! 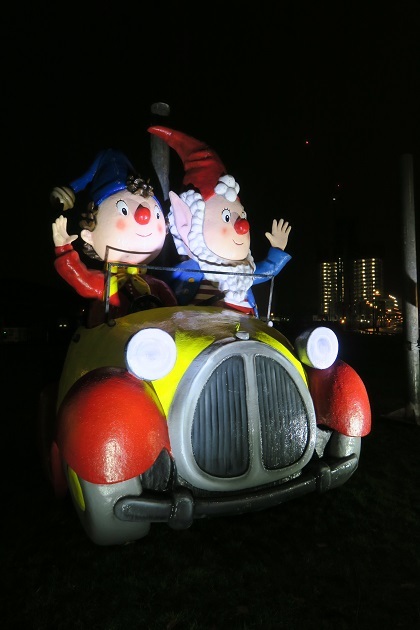 We had loads of fun Pam – a great family show and then those lovely lights, such fun on a wintery evening! Fantastic origami boats, I’d love one or two for my bathroom! Aren’t they just gorgeous – they would brighten up my bathroom too!! I didn’t know he was still around but remember having some Noddy books!! The light displays and little boats are lovely. You don’t need a show with all that to see! 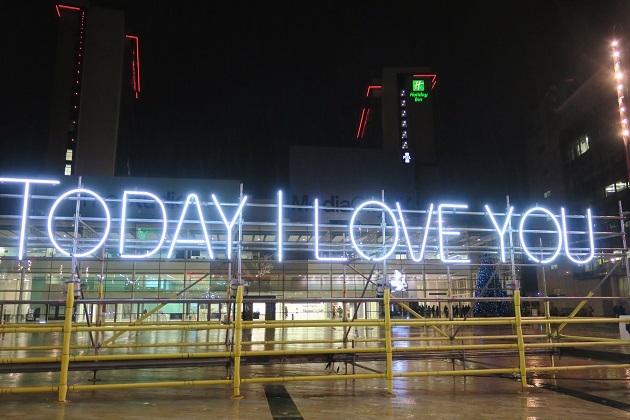 True – and we did go back to see those lights again!! It’s on our doorstep George – we’re very lucky!! What a lovely tradition to have every year. We’ve still not been to The Lowry it looks like such a great place to even just hang around. Happy new year! You should go to have a look around next time you’re in the area. 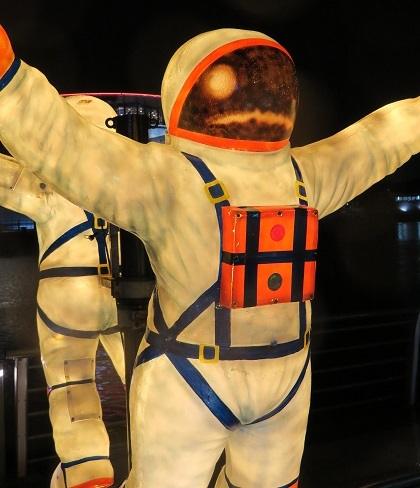 There’s loads to do around here and they have exhibitions and loads of child friendly stuff going on as well. We go to the theatre quite a lot anyway but there’s just something special about going at Christmas time – the lights were an extra special bonus! Can’t believe Christmas is all over Rosemary and we’re back to normality again – it just flies past!! We try and go to the theatre as often as possible but there’s just something extra special about a Christmas visit and Chitty was the perfect thing for us to see – we all loved it! Hope you’ve had a good New Year start too. It does seem strange after all the build up Joy – all the decorations taken down and packed away for another year! It’s always a bit quieter here in January as so many people are away with it being the long school holidays!